Want to see more of AgencyIntelligence? With AgencyIntelligence, you can deploy a full suite of features that work best for your agency. Easy to use interface allows total control over your agents while keeping up with the growing needs of your business. Agency management made point-and-click easy. AgencyIntelligence puts the most important tools right at your fingertips. We've added hundreds of new features to boost productivity, support the latest changes in compliance, and make everyday tasks easier. Starting from the beginning of the customer life cycle, AgencyIntelligence makes it easy to organize leads, assign call campaigns, and maximize contact with potential clients. Once a lead is converted to a customer or client, AgencyIntelligence combines customer data from all channels of communication, giving you a more complete picture of how they interact with you. This allows you to give a consistent and relevant experience to your customer and it helps you tailor a solution that is relevant to your clients. With AgencyIntelligence's reporting and analytics, you know what's happening with your agency each and every second, so you can take action when it really counts. With real-time capabilities, you can react to trends, change marketing tactics, and quickly abandon campaigns that aren't working, saving you time and money. Explore AgencyIntelligence's best features first hand. Request a demo today and quickly get set up. 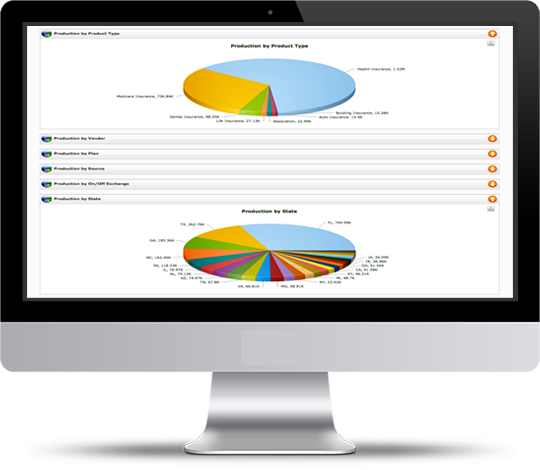 AgencyIntelligence gives you complete control of your agency. Easily create hierarchies and manage user access. Keep track of potential clients as well as repeat business. Spot new opportunities to expand your insurance services, all in the same system. Process commissions with ease. AgencyIntelligence can handle both manual and automatic processing, and is totally customizable. AgencyIntelligence generates multiple reports containing production data, policy summaries, call performance and commission tracking. AgencyIntelligence provides this data almost instantaneously. We recognize the insurance industry requires a unique set of functionality when it comes to lead management. AgencyIntelligence uses ForcedLead technology to support your agency with up to date contact opportunities. Automated phone dialing is included with AgencyIntelligence; through SIP technology, agents place calls directly from their system. This feature boosts productivity by eliminating unnecessary steps and ensuring time management is maximized. We are a software development company which specializes in insurance agency applications.